Avid readers of this blog know that I am an outspoken supporter of the ongoing efforts to restore the old Cotton Brothers Bakery building on Bolton Avenue in Alexandria. The building, a massive art deco structure and one of Bolton Avenue’s primary anchors, has remained vacant for well over two decades. A couple of years ago, it was purchased by a local demolition contractor, which, obviously alarmed our local preservationist community. They quickly sprung into action and successfully applied to have the Cotton Brothers Building placed on the Louisiana Trust for Historic Preservation’s annual list of the Top Ten Most Endangered Properties in the State. Unfortunately, the Alexandria area has more than its fair share of “top” endangered buildings; the Hotel Bentley, Mount Shiloh Baptist Church, the Dairy Barn on the grounds of Central State Hospital, the Armour Building, and the Thompson-Hargis Mansion, among others, have all recently made the list. Shortly after it was designated as one of the State’s most endangered properties, the Red Cross, with the help of a generous donation from Magna International, announced their intention to purchase and renovate the building. If you have driven by the building in the last few months, you know renovations are well underway, and already, the building looks transformed. (If you’ve passed by it at night, you may have also noticed that the lights are on for the first time in a long time). Last month, the project was featured in the national trade publication Public Management, which, in an extensive article titled “Saving Part of One City’s History,” praised the effort as an excellent example of a successful public/private partnership. Renovations are not complete, yet this project is already achieving national attention and praise. Members of the Red Cross board of directors and CEO Leann Murphy approached Alexandria’s mayor to request the city’s assistance in finding a facility there. 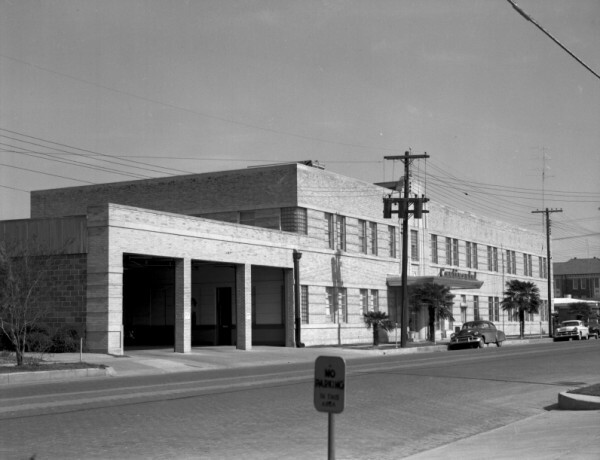 The city recommended the Cotton Brothers Building as one possibility. Initially, the Red Cross eliminated the building from its list of potential new sites because of possible environmental problems stemming from the building’s original construction as well as its subsequent use as home to Continental Trailways. A local corporation, Petron LLC, together with AHPC convinced the Red Cross to reconsider the building. Steve Ayers assured the nonprofit that Petron was willing to renovate the building for the Red Cross at cost-plus-zero. The results of the phase 1 assessment did indicate that a phase 2 assessment was needed, but the efforts to clean up the site following the closure of the bus terminal had been advanced, and the presumption was that environmental contamination was unlikely to be extensive. The contaminants of concern included asbestos, lead-containing paint, PCB, mold, and groundwater contamination along with an underground storage tank (UST) no longer in use. A phase 2 environmental site assessment was performed in 2008 as part of the Targeted Brownfields Assessment (TBA) Program. Through this program, the U.S. Environmental Protection Agency (EPA) provides free assessment services to support communities’ brownfields cleanup and reuse projects. The state of Louisiana, through the Louisiana Department of Environmental Quality (LDEQ), required additional sampling to evaluate enclosed space for vapor intrusion issues related to a potential reuse plan for this site. EPA went extra steps and funded additional sampling. In July 2008, a TBA phase 2 report was prepared to relieve the prospective purchaser of concerns about site contamination. EPA went the extra step again in 2008 by providing a phase 1 update to assist a new owner in satisfying liability protection criteria for a bona fide prospective purchaser. EPA also obtained concurrence from the state historical preservation officer to ensure that planned TBA work would not adversely affect any cultural or historic resource; this is a requirement of the National Historic Preservation Act, Section 106, which involves a review of any federal undertaking. EPA spent more than $91,000 on TBA assessment work, saving the Red Cross expenses that it would not have been able to justify to its board of directors and its donors for the building project. It is worth noting that in addition to attracting assistance from the City’s Targeted Brownfields Program and the Environmental Protection Agency, the Red Cross was also supported by a number of local foundations and benefactors, including Coughlin-Saunders, the Martin Foundation, and the Huie Dellmon Trust. Another critical factor in convincing the Red Cross to move forward with renovation plans was the state of Louisiana’s historic preservation tax credits. With the help of the AHPC’s Melinda Anderson and Allied Design Group’s Bill Tudor, parts 1 and 2 of the Red Cross’s application for Louisiana historic tax credits have been approved. Once the project is completed according to the plans as approved, the Red Cross will receive tax credits that can be sold, giving the nonprofit additional funds to support ongoing expenses. The Red Cross can sell the 25 percent tax credit for as much as 80 to 90 cents on the dollar, meaning more than $240,000 will come back to the nonprofit. It is important to note that numerous local properties easily qualify for the same tax credit program, and a handful of those, due to their placement on the National Register of Historic Places, would also qualify for an additional 20 percent tax credit. These programs are not grants, however; they must be purchased and then sold. Thanks to the cooperation of the city of Alexandria and the AHPC, the Louisiana Trust for Historical Preservation, the state of Louisiana, the Canadian Red Cross, the American Red Cross, and the EPA and its brownfields grants, a magnificent structure has been preserved for an important community use. 1. Talk to all of the stakeholders at every step of the process. Since early in the project, the Red Cross has had discussions with all the different stakeholders, explaining what its needs were, learning what resources were available, and understanding what constraints might or might not exist surrounding the potential project. In particular, the nonprofit took time to meet with neighborhood groups and community foundations to explain its ideas regarding the project; this helped build community support and raised more than $400,000 in additional funds necessary for the property acquisition and renovation. 2. Ask for help. The overwhelming community support—from both the private and the public sectors—for this project was instrumental in fast-tracking it through the various federal and state processes required for the building’s renovation. 3. Communicate often and keep the information flow going back and forth. Leaders in the effort identified e-mail as being critical for ensuring that all the steps in a complicated process were taken. Clear and constant communication was necessary in order to adhere to the environmental assessment and historic preservation processes necessary for this project. 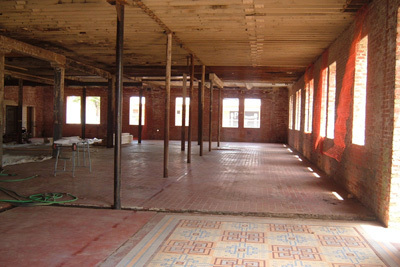 Although the renovation of Alexandria’s Cotton Brothers Building is a unique project, the fundamental organizing principles the community implemented in bringing the project to fruition can be applied by most communities to brownfields projects in their own backyards. On a personal note, while I know there are some who may question the wisdom of investing on Bolton Avenue, a corridor that has been plagued by blight, crime, and disinvestment for decades, I believe the Red Cross, particularly their Executive Director Leann Murphy, should be praised for their vision and their commitment to restoring one of Central Louisiana’s most important and unique buildings. During the last couple of years, in large part because of the City’s S.P.A.R.C. initiative, I have had the opportunity to serve as a tour guide for a handful of nationally-recognized architects, developers, and urban planners. Nearly all of them, almost immediately, were impressed by the potential of Bolton Avenue. The Cotton Brothers Building may be the largest and most significant art deco building on Bolton, but it isn’t the only one. The Don Theater, for example, is only a block away and, nearby, there are a number of remarkable old storefronts and service stations. “It’s got ‘good bones,'” is something about Bolton Avenue that I have heard more than once. Make no mistake, the overall revitalization of Bolton Avenue is a challenging project, but as the Cotton Brothers restoration proves, it is a project that requires support and collaboration from numerous people throughout the community. In some instances, it may also require creative financing, the use of tax credits, and targeted improvements to public infrastructure. But, clearly, we cannot afford to do nothing or to remain complacent. Thanks to the Red Cross and others, we have made an important first step.